Joseph Anthony "JOE"Cimer - of Tobermory, age 82, passed away suddenly, peacefully, on Thursday June 15, 2017, at Lion's Head Hospital. Joe leaves behind his immediate family; best friend and love of his life for 56 years, wife Mary Ann (Moiseshyn), their 3 dearly loved children Clarise (Terry), Karen (Caroline), Joey (Lidia), 3 "adored" grandchildren, Madeleine, Russell, and Julian. Joe was an only child and appreciated so much having a brother in law, "Bill" Moiseshyn (2014), sisters in law Claire Moiseshyn and Gloria Wood, nephews John, and Paul (Nelita), niece Mary Kay Faroni (Frank). Joe was thankful for his mother-in-law Katherine Moiseshyn (1998), and his ‘lifesaver’, Dr. Doug Baggs. Joe was predeceased by his parents Joseph (1988) and Piroska, (1990). His parents emigrated from Hungary in 1932 and Joe has kept in touch with the few cousins living there. Joe was raised, attended school, worked, married, raised family in Windsor Ontario. 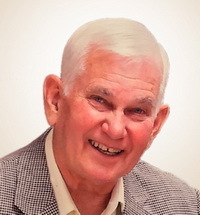 He was employed at Seagram Distillery in Amherstburg and Beauty Counsellors Cosmetics in Windsor before he started his teaching career at St. Clair College School of Business in 1968, where he proudly loved to serve and instruct until his retirement in 1994. As much as he enjoyed his home in Windsor and Stoney Point where he was a proud member of Knights of Columbus, Mother Nature kept drawing him to the Bruce Peninsula where he was constantly amazed by her beauty there. Builder friend Armand Roy and Joe together built "Treeview", the Tobermory home Joe and Mary Ann have resided in since 1999. Joe has certainly made his presence felt in numerous ways in Tobermory, but he is most proud of his work on the Committees for the Lion's Head Hospital, and Tobermory Family Health Clinic. Joe and family are grateful to friends and community for all their understanding, kindness, patience, and friendship over the years. Special "THANK YOU " to the Labrecques, Robinets, Sister Sylvia, for your unconditional care, help, love and support. Thank you Brad Inglis for all you do. Bless you. A celebration of Joe's life will take place on Saturday, June 24 at 1 p.m. at Tobermory United Church, 5 Brock Street, Tobermory, following the regularly scheduled Catholic Mass for the people which takes place each Saturday at 1130 a.m. in the same Church. In lieu of flowers, please donate to the Tobermory United Church Garden Project, or Charity of your choice. Arrangements entrusted to Thomas C. Whitcroft Funeral Home and Chapel, 814 Bruce Road 8, Sauble Beach, 519 422 0041. Condolences may be expressed online at www.whitcroftfuneralhome.com.